There are eight poolview condos available. Each Put-in-Bay Poolview Condo has 2 bedrooms, 2 baths, and an eat-in kitchen. The kitchen is stocked with the necessities to make and serve a meal, just bring your own food. Also, each unit sleeps up to eight guests comfortably in 4 beds total in 2 bedrooms. The brand new pool is only a couple years old. So, this is another great feature of the PoolView Condos. Guests can opt to bring their own beverages, and catch some rays without breaking the budget. Comfortable chaise lounge chairs and tables set the stage for a lovely, sunny day with the kids or friends. Also, the location is desirable due to its central proximity. The downtown Put-in-Bay area is about a mile away. So, guests are close to the action. However, when wanting to retire for the evening, the Poolview Condos provide a nice place to unwind. 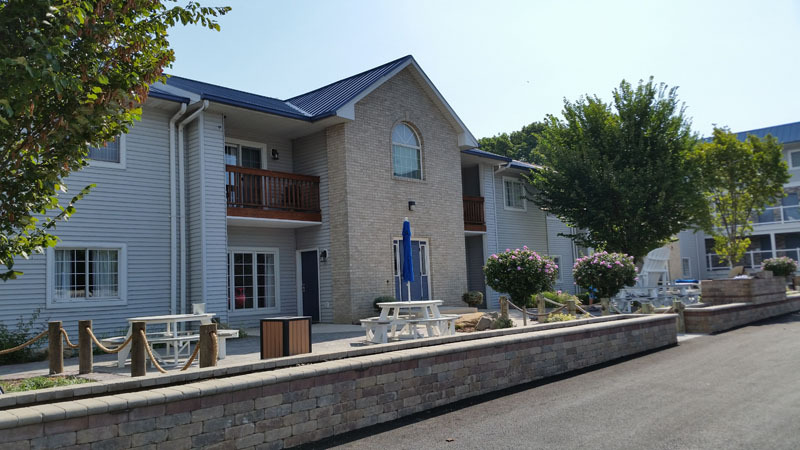 At the Put-in-Bay Poolview Condos, we strive to provide our guests with an exceptional stay. The guest is always our number one priority. Therefore, staying here will ensure you will get the service and attention your group deserves. So, the question remains: what are you waiting for? The time is now to set watches to Island Time. For Reservations or additional information, call the reservation center at 216-898-1105 or submit your reservation request and book your condo online from the convenience of home!